Those of you who mourned the departure of Daylight Donuts can take heart. 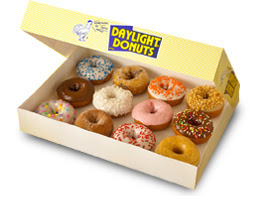 A new Daylight Donuts will be opening in early June at 1225 E. 17th St., next door to Staker Floral. Jim Feuling, who runs I Buy Gold, the business in the building at the moment, said he has always liked Daylight Donuts. When he saw an opportunity to open a new one (the shop in Taylor's Crossing closed this past winter), "I decided to grab it," he said. Daylight Donuts was begun in Tulsa, Okla., in 1954 when Tommy and Lucille Day began producing a light donut mix each morning and selling it to local shops, most often from the trunk of their car. When they sold the business in 1977, to Jerry and Linda Hull, the company consisted of 200 shops and a fleet of trucks. The Hulls sold the company in 2002 to John and Sheila Bond, who have guided growth to nearly 1,000 retail outlets worldwide. For an operator like Feuling, there is a licensing agreement under which he receives products and the rights to use the name. He said he is shooting for an opening sometime around June 6.